The big bang Bank Recapitalization is here! Call it a bailout, call it recapitalization, or say that the government financial engineered a way to partially solve the bad loan problem. But what will they do? The government will issue a vaguely worded thing called “Bank Recapitalization Bonds” for Rs. 135,000 cr. which will be used to buy more shares in Public Sector Banks. The time frame: 2 years. The government will buy Rs. 153,000 cr. worth shares in banks. They will raise 58,000 cr. themselves, so there’s a 75-25 government-private infusion of new money into banks. If this is pulled off, that is. This adds up to Rs. 211,000 cr. which is a lot of money. It’s even more than Reliance Jio’s debt, and that’s a fine target to beat. Why Do Banks Need To Recapitalize? Its like this. Banks create money. They can create money at will really. If I lend you money, and you put it back in a deposit in my own bank, I have created money. But actually it gave you the loan, and then you put money into the bank. So the order does not necessarily matter for the banking system. Now if I lose Rs. 50 on those loans because some fellow defaulted (5% NPA) then my loss hits my capital. My capital falls to Rs. 50. Now i have only Rs. 50 on Rs. 950, or around 5% as capital. Not good. So at this point I have to raise Rs. 45 as capital to come back to 10% capital ratio. Or, I have to somehow call in loans of Rs. 450. Calling in loans isn’t possible so I stop lending more – I cannot. This is what has happened. Public Sector Banks have frozen up on lending because they can’t lend more, as their capital ratios will not allow any more. Banks have Rs. 100 capital and have lend Rs. 1500 (6% capital ratios) They have losses of Rs. 50 they know about and are unwilling to take (Net NPAs). So the government gives them Rs. 50. Their capital increases to Rs. 150. Then they take the Rs. 50 loss. So now they have Rs. 100 capital on Rs. 1450 lent. Better capital ratio than earlier! Magically, things change. Because of better capital ratios, banks can now raise more capital – say another Rs. 50 is raised. Now they have the ability to lend another 500 rupees, to maintain say a 8% capital ratio. This is a higher capital ratio than earlier. Credit increases. Some more leeway for losses also exists. Effectively, what the government wants to do is: Force banks to take losses by pushing NPAs to real losses, as the government replenishes the capital that is lost. But How Will The Government Get 135,000 cr. more? Already, the deficit is about 500,000 cr. How will the Government get Rs. 135,000 cr. more? The answer: financial engineering. They’ll issue bonds. These bonds might have to be bought by banks. The banks will give money to the government which will turn around and buys shares in these banks. The banks get to keep the money; they get bonds and they issue shares in exchange. This is interesting, because effectively the banks are giving their promoter (the government) money to buy their own shares. But that’s how it works because the government has guns. Yes. Giving banks capital means they can be forced harder to take losses. Taking losses isn’t easy – you have to auction off the collateral, you have to seize assets and you have to see that loss destroy your capital. But banks took the weak excuse that recognizing losses hit their capital ratios and there was a spiral – low capital ratios means investors would not put in more money, so they couldn’t lend to new, good borrowers and were saddled with the bad borrowers. auction off the assets (or get a new promoter to run it). This leeway has not been easily provided in the past, and now banks have to be pushed to recognize losses fast. This is only good if banks actually recognize losses. If they continue to pretend-and-extend, all that this will do is to cause extreme inflation (as bank books will be bloated with capital, and not enough losses will have been taken and the situation continues). Does it mean the promoters get bailed out? The bankers? The bankers, yes. Nothing happens to them even if they pretended and extended these NPAs too long. The promoters should not. In effect the banks should take over the defaulting companies. Recognize full losses. Sell all the assets in a mega auction. Do not allow the promoters or relatives to bid for these assets or own them for five years later. And with what they recover, it comes back as capital because you recognized a full loss and later recovered something back. Marking down the loss of a loan doesn’t mean the promoters get away. The recovery is still pursued and whatever is recovered becomes a profit. My point: Go into aggressive recovery mode. Won’t There Be A Problem With The Bonds? Well, we don’t know what kind of bonds they will issue. Will they be tradeable? Will they qualify for SLR? Will they be issued directly to the banks that get the capital, or to the players in the market? In fact, even the finance ministry doesn’t know. It’s that kind of time when you get credit for saying “we’ll issue bonds” but you don’t actually know what kind of bond. In the 90s, the government did something like this by issuing recapitalization bonds to the banks themselves. These bonds were non tradeable at first, didn’t qualify for SLR and later were either converted to equity or made into perpetual bonds. But What’s the Negatives? Dilution. For shareholders, we saw a bank with Rs. 100 book just get diluted by Rs. 50 from govt and Rs. 50 from private. If valued at 1x book, we have a 50% dilution. Oh, this will also increase govt. 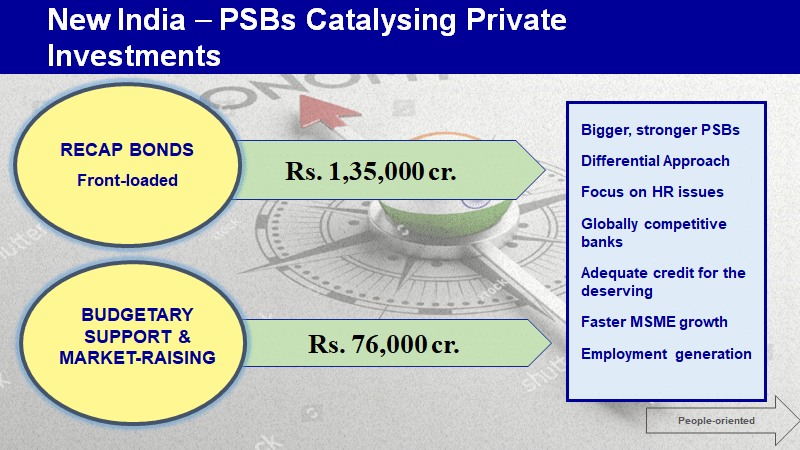 holdings – in Andhra Bank, for example, the government owns 70%. If they bought Rs. 7,000 cr. more then the govt will have 87%, if all if it is from the government. If you assume 75-25 dilution between public-private, that’s about 73%. For bond market players: Yields change. The 10 year bond hasn’t yet reacted but it will tomorrow. 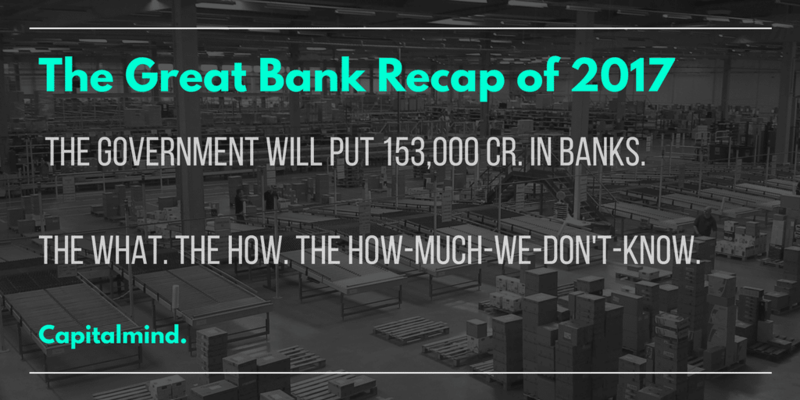 An additional 135,000 cr. of bonds will be a pain. But what if it’s not marketable? That means buying banks can’t sell them, so there’s no additional supply. Non marketable bonds are a bad idea. We’ve learnt that in the past. They just sit on bank books and hurt lending anyhow. So might as well make them marketable. Some yield pressure will come but eventually we have to recover. Just recognize the problem already. But yields may go up because of inflation that will come. India doesn’t have the problem of low demand for credit. There is demand but banks have lousy capital ratios so they won’t lend. And capex demand has dried up somewhat, but that will recover over time. If banks start lending again, we are gonna see a big expansion in money supply. Liquidity, in India, with credit supply, means inflation in the future. The RBI’s been good at watching this recently. So they will raise rates accordingly. This could really be the end of the low-interest-rate cycle if there is an actual recovery in public sector bank credit now. So yeah, we’d stay away from the longer term bonds. For another reason too – US bond yields are rising, and at some point if they hit 3% that will be another thing that hurts our bonds. Will this bloat the government fiscal deficit? For 2017-18, yes. Because effectively the government invests money into the banks. That investment is called an “outflow”. The Fiscal deficit is = All Inflows minus all outflows except the part that involves borrowing. The government is trying to pull wool over our eyes by saying that this is not a fiscal deficit issue because of some IMF rigmarole. That this is issue of shares against cash or some such. 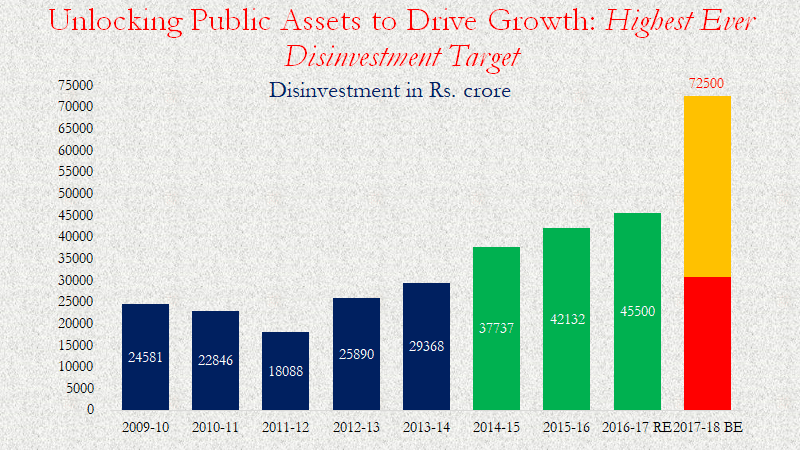 That is utter bull, because they consider disinvestment to be revenue, and in fact highlight it in the same presentation! Also some people say it’s not a problem because it doesn’t increase demand for goods or services. Come on really – this is direct bank capitalization, and banks can now multiply the money given, and that will do much more to demand than even directly giving people money. So let’s not pretend it’s not going to hit the fiscal deficit, please. But hitting the fiscal deficit is not bad. India’s in a crisis. The stock markets may not feel like it but it is. And therefore we should let the fiscal deficit widen if it means bringing things back to shape. There are other issues with the capitalization, but the widening of the fisc is not that big a deal, in my opinion. And note: the bonds have to be paid back. Sometime in the future, the 135,000 cr. and the interest on it has to be paid. Think of the company that’s struggling to repay. It now sees that its competition gets a loan semi-write-off, and then decides it can default too. The NPAs could actually increase! And from now to the point of bond issuance, we might actually see more defaults. That’s why my point about aggressive recovery and promoter non-participation in the auctions is important. Make it a point that we may take the loss, but we’ll hurt you as well. India will go through a crisis. Because all the rotten promoters are all the people with heavy political connects and much of the money. So what? If we’re rebuilding the banks, let’s also rebuild corporate India. Banks also have hazard. They are now allowed to do bad lending again! At the very least they should start removing the top management of banks that are in really bad shape, and merge them with better managed banks. Let’s assume that 60% of Net NPAs (i.e. no provisions for them yet) are wiped off as losses. 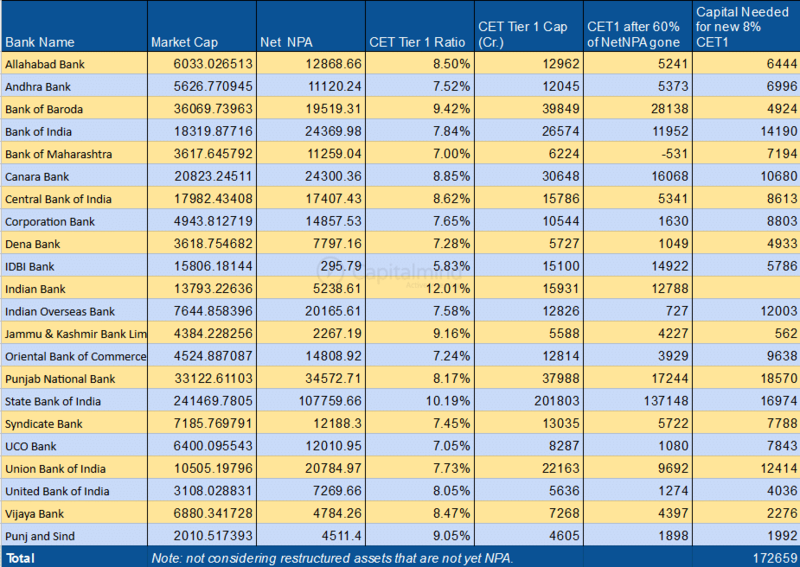 The Common Equity Tier1 Capital (CET1) gets hit to that extent. So let’s assume we recapitalize to a point of 8% CET1 on the remaining assets. This is a table of capital needed. Note how Indian Bank is the best of the lot needing no capital. Also on the last column is the capital. Look at the market cap to estimate dilution. We don’t know how it’s going to work, really. Which banks get what. And how. And exactly when. All we know is this: These banks are getting a lease of life. The government, from a “disinvestor” is becoming a net “investor” in public sector stuff. The fiscal deficit will widen this year. The banks have to recognize losses fast and aggressively recover, or the moral hazard will increase NPAs. This is good for the economy even with these problems. And avoid longer term bonds.